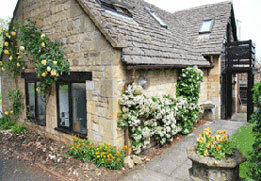 Just over half a mile from the centre of Broadway Village you will find Laburnum Cottage in a tranquil situation overlooking the Cotswold hills with its own garden. 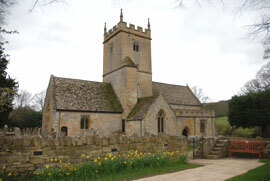 Positioned next to Broadway Court and near to Broadway's 11th Century Norman Church of St Eadburgha's, on the road to the village of Snowshill where "Bridget Jones Diary" was filmed. The accommodation in this former old Cotswold stone barn has an elegant sitting room with carved wood/tiled fire surround and a gas log fire, tv and dvd player. The fully fitted kitchen with limed oak units has a dining area and the cottage has a private established mature garden with patio and seating for sunny days. A polished oak staircase ascends to 2 double bedrooms - one with french doors leading to a balcony overlooking the garden. Hand painted old pine bedroom furniture and antique bedsteads together with old oak and mahogany furniture help give this cottage its olde worlde charm. 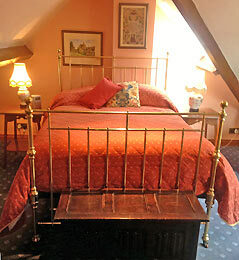 The cottage benefits from full central heating and the attractive bathroom has a separate bath and power-shower. 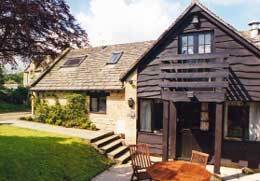 The cottage provides an ideal situation for that "get away from it all" holiday with excellent walking nearby. Locally owned the cottage is comfortably furnished. *TV, DVD player & Radio. Cottage available on a minimum of 3 nights at weekends. *Enclosed garden with patio and seating. *Dog friendly by prior arrangement. *Price includes towels, linen, gas & electricity.